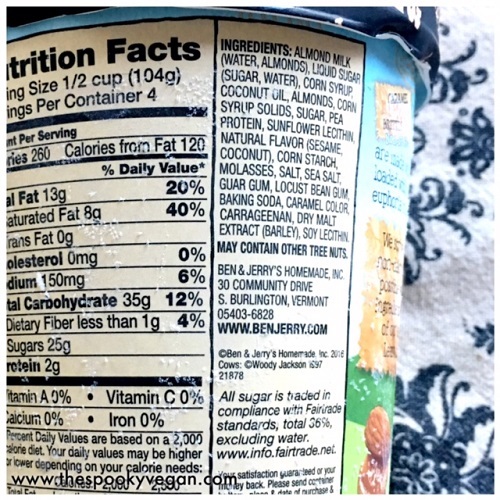 New Ben and Jerry's vegan flavors! 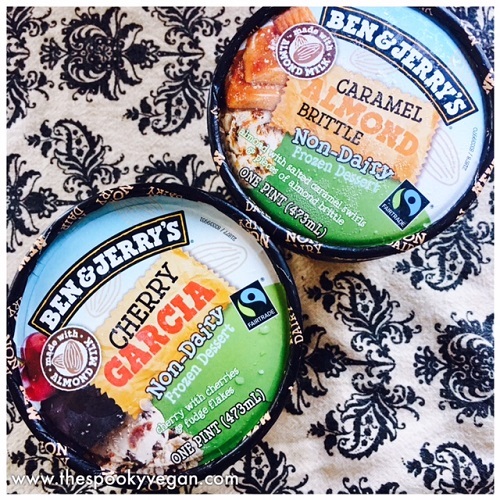 Ben and Jerry's secretly released three new vegan ice cream flavors this past week, which were quickly spotted and shared by vegans of Instagram! 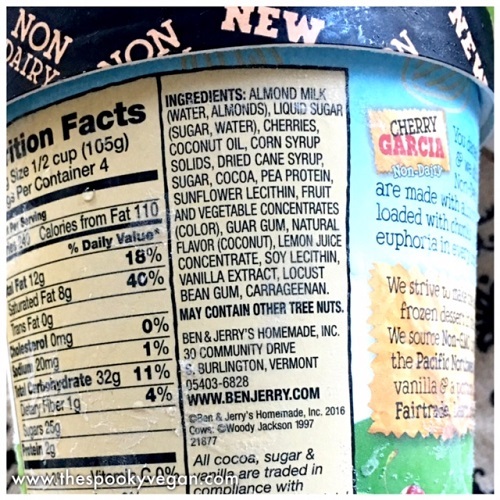 Ben and Jerry's already has four vegan flavors (Chunky Monkey, PB and Cookies, Chocolate Fudge Brownie, Coffee Caramel Fudge) that were released just last year (you can read about each of those flavors HERE), and now they have added THREE new flavors - Cherry Garcia, Caramel Almond Brittle, and Coconut Seven Layer Bar! I was able to find two of the three flavors at my local Albertsons' store (if you are local, it's the Irvine store on Campus Drive near UCI) for $5.79 each. Pints are a little pricey, but I'm hoping as these become more widely available the price will come down. This particular Albertsons store had all three vegan flavors but were already sold out of the Coconut Seven Layer Bar. Short descriptions of each flavor are below. Caramel Almond Brittle - "almond with salted caramel swirls and pieces of almond brittle"
Cherry Garcia - "cherry with cherries and fudge flakes"
Coconut Seven Layer Bar - "coconut with fudge chunks, walnuts, and swirls of graham cracker and caramel"
Also to note, Ben and Jerry's is owned by Unilever (which tests on animals for some of their products), so how you feel about this parent company may determine whether or not you purchase this brand. 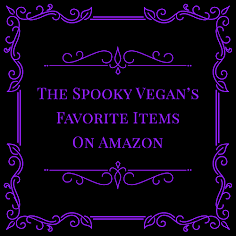 However, I am glad that bigger parent companies are investing so much in vegan products and I'm hoping that by purchasing these items it shows them what high demand there is for non-dairy, vegan products! 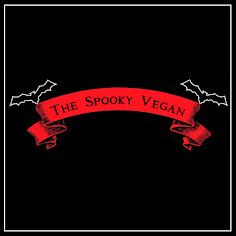 As there is more of a demand for vegan products these companies will invest more in vegan options and adopt more animal- and planet-friendly policies. 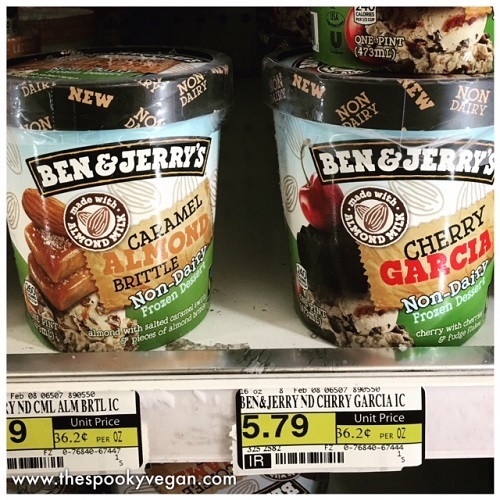 Have you found these new Ben and Jerry's vegan flavors yet? Which flavor are you most excited about?